The new Gattaca TV series sounds like a blending of all our favorite themes: It's a police procedural, dealing with the futuristic genetic civil liberty crimes, sprinkled with an odd-couple element based on making a Valid and Invalid partners. MTV spoke with NCIS producer Gil Grant on his plans for the new Gattaca TV series, which was announced a few weeks ago. While he still doesn't have a script for the proposed idea, he does have a lot of ideas. "I came up with a world which is populated with Valids and Invalids, the same premise [as the movie], but taken into a police department where we're… integrating, using the analogy of the ‘60s Civil Rights struggle...Even though it's technically illegal to discriminate against Invalids, just like in the ‘60s, people did," Grant continued. "So it's come to pass that [the government has] ordered the police department to hire their first token Invalid into the detective department. What we're doing is we're taking an Invalid and teaming him up with a Valid, a seasoned officer. You know, it's oil and water." 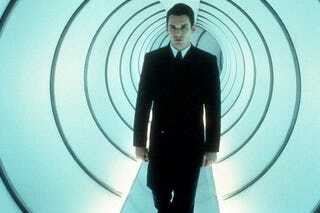 Sadly, he doesn't think any of the original characters will be returning, and this project is wholly on his own, so no help from the original producers or directors of Gattaca. Still, I like the idea of watching a police procedural set in a civil rights movement in the future. It's like Life on Mars, only in reverse. And odd-couple buddy-cop shows are always a good thing.